Visitors to our studio and giftshop often remark about the one-of-a-kind creations found there & which are not available on our website. Here, in our continuing blog series, are a few more. Enjoy the tour! These retro sneakers have that well-worn look without the well-recognized odor! A name or short message can be inscribed on the shoe at no/charge. We carved a 4-foot long sneaker of this style a few years ago for display in our outdoor sculpture gallery. It is now owned by a folk art collector in California. 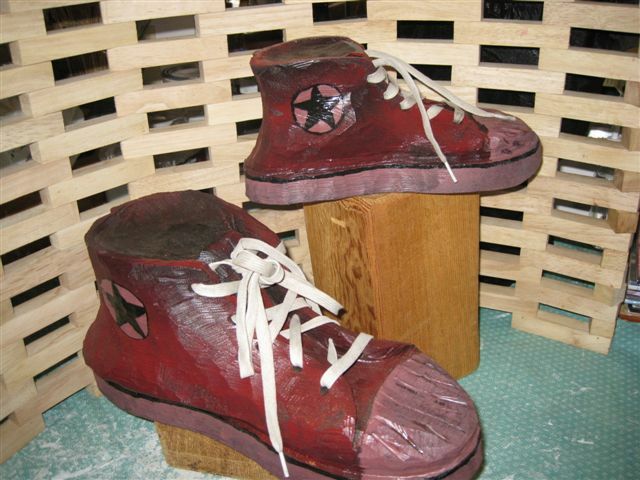 The original big shoe weighed nearly 200 lbs! These snapshots presented in collage format are a few of the visual experiences to be found when visiting Dog Bark Park in Idaho. Meet bicycle boy Rodney, fuzzy faced Sprocket, flag face, and more. Poster details: 12″ x 18″ glossy. Signed. $11.95 unframed. Free Shipping. 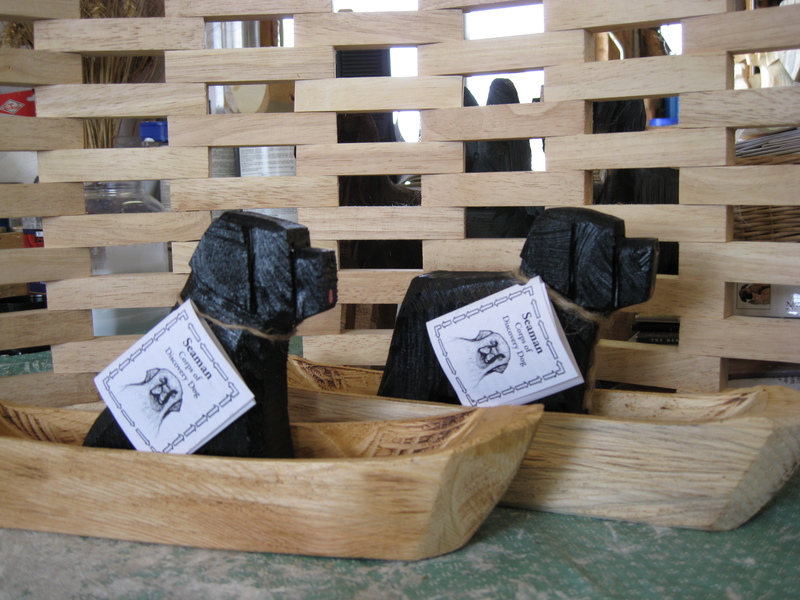 Chainsaw-carved replicas of that famous Newfoundland of the Lewis & Clark Expedition, Seaman. Purchased by Meriwether Lewis for the Expedition, Seaman was an important food gatherer, protector, & ambassador for the Corps of Discovery. Seaman w/Dugout Details: Dugout apx 12″x2.5″x2.5″. Seaman apx 6″x2″x5″. Choice of standing or sitting Seaman. Hangtag about Seaman’s place in history with the Corps of Discovery Expedition of 1804-1806. $29. Free Shipping. Dog Bark Park is located in country travelled by Lewis & Clark. We enjoy telling the story of the dog through our artwork and in skit format which has taken us to ceremonies at Monticello on the very day 200 years ago (in 2003) that Pres. Jefferson authorized the expedition! And, we still enjoy sharing Seaman’s fascinating story. Stay tuned for more blog visits of our studio.